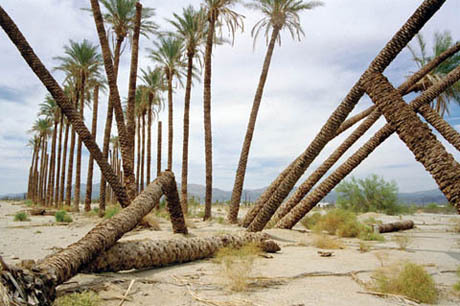 IMAGE: From Hinterlands: A Voyage into Exurban Southern California [pdf] by the Center for Land Use Interpretation. The Center for Land Use Interpretation (CLUI), for those of you who are not yet familiar with its delights, is “dedicated to the increase and diffusion of information about how the world’s lands are apportioned, utilised and perceived.” It is also one of the treasures of Los Angeles (or Culver City, to be precise), and the enjoyment with which I recently read its Winter 2011 Lay of the Land newsletter prompted me to spend to spent a happy evening revisiting old issues and rediscovering several food-related gems. Twenty four hours a day, seven days a week, specialised trucks back up to the edge of the hill, and tip a 600 cubic foot of molten slag overboard. The glowing, thousand degree centigrade liquid slides easily down the slope, throwing heat that can be felt hundreds of yards distant. As the liquid cools and solidifies, a crackling, rock-building sound can be heard. 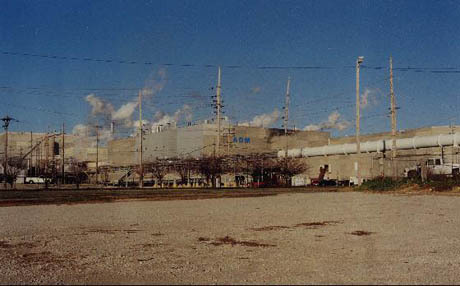 IMAGE: Monsanto Phosphate Plant and Slag Pour from the CLUI Land Use Database. 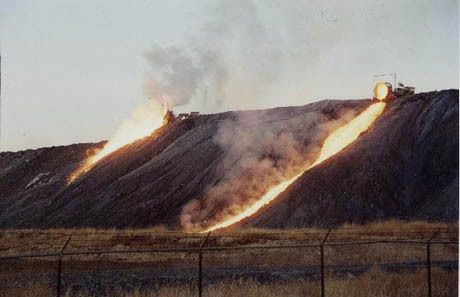 The slag consists of calcium silicate, a by-product of the process through which the next-door Monsanto plant produces phosphates for use in “soft drinks, insecticides, toothpaste, fertilisers, and herbicides.” The mound of cooled slag has been accumulating since the plant opened in 1952, and is apparently 150 feet high in places; its blackened surface providing a dramatic contrast to the white-hot liquid minerals that cascade down its slopes several times every hour. Bizarrely, calcium silicate is itself used in the processed food industry as an anti-caking agent (for example, according to Wikipedia, it can be found in McDonald’s Angus Beef patty seasoning). IMAGE: Archer Daniels Midland headquarters from the CLUI Land Use Database. 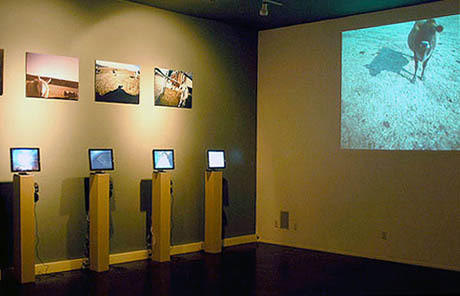 IMAGE: On the Farm exhibit at the CLUI, photo by the CLUI. Mountains of molten anti-caking agent, pipes full of corn syrup, and a overwhelming focus on the feeding trough: a handful of perspectives on the most pervasive form of land use in the United States from its pre-eminent chroniclers. I’m excited to say that over the coming year I’ll be working with the CLUI team to analyse and document another edible geography: the artificial cryosphere, by which we mean the network of refrigerated warehouses, trucks, and home appliances that are tied together across America in a (relatively) seamless cold chain. Watch this space — and, of course, your suggestions for interesting sites and sources would be much appreciated.